The machine is used in drilling though holes and blind holes of FPC flexible printed circuit board cover layer ,rigid and flexible circuit. Flying drilling technology, table and galvanometer with linkages are applied in machine to improve blind/through holes production. Adopting imported laser, high-performance galvanometer, higher pulse frequency, higher power peak, more fine cutting path planning. 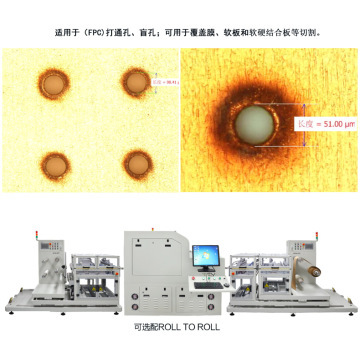 There are functions with automatically precision correction, auto power compesation, auto focus and automatic correcting movement and high interactivity. Custom-made 250 mm or 500 mm wide RTR automatic loading system and various kinds of software functions. Following standard to design and produce machine, to achieve better quality in every steps, long work time without any downtime. AOM module is applied to correct power by single pulse sampling, to make drilling quality consistency and reliability. Guangdong Zhengye Technology Co., Ltd.(Stock code:300410) located in International manufacturing Dongguan City, which is a high and new-tech enterprise .It specialized in researching & developing, producing, selling and after-sale services of the Laser Cutting / Laser drilling /Laser Engraving /Laser marking / PCB machines and consumables. It was founded in 1997 with a register fund $26million.Factory building area is more than 75700 square meters. Staffed with more than 1000 energetic and youthful employees, including 5 young experts with doctor degree, 40 researchers with master degree, 120 engineers with bachelor degree, Zhengye Technology have set up institutes of laser application & electronic controlling technology & software technology in Dongguan City. Furthermore, the company has built long term, steady and interactive cooperation relationship with many well-known universities and institutes, such as Xi’an University, South China University of Technology of Optics and Fine Mechanics. Zhengye Technology sticks to the business philosophy of "Return customers with high quality service". She is not only a well-known industry laser equipment manufacturer, but also an excellent service provider. Her highest goal is customer satisfaction. And improving products quality and performance, to bring the best service experience and create maximum value to customers is Zhengye Technology's mission. Firstly, 24 hours after-sales service consulting, professional engineers help you solve the problem remotely. Secondly, after-sale service agents all abroad makes your after-sale easier. 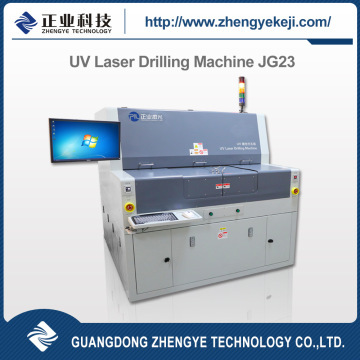 Thirdly, Professional laser equipment engineers overseas maintenance and provide technical support services. Fourthly, Customers, who purchases Zhengye Technology’s equipment, can take free professional training in our factory which allowing you easily to master operation skill of laser equipment from drawing to a variety producing skill. Meanwhile, we will send engineers oversea regularly to organize training and technology exchange about a variety of operation and applications of laser technology. 1)Q: Are you trading company or a factory? A: Zhengye is professional manufacture since 1997. 2)Q: Where is your factory? How Can I visit there? A: Our head office located in Science and Technology Park, Songshan Lake, Dongguan City, Guangdong province, only 40 minutes from Shenzhen airport. And we have two branch factories, one located in Gaobu Town, Dongguan City, Guandong Province. Another is located in Kunshan City,Jiangsu Province. Warmly welcome to visit us. 3)Q: How does your factory do regarding quality control? 4)Q:How long is the warranty time for your products? A:Our officially promised warranty time is 12 months since product arrival customer factory at best. 5)Q:What payment methods your company accept? A:We accept most of the payment methods,but mainly accept T/T,L/C. 1.What is your main business? 2.What kind of material the machine will work on? 3.What is the material size and thickness? you will get the best reliable products in reasonable prices. 15 working days after down payment. Guangdong Zhengye Technology Co., Ltd.,(Stock code:300410) located in Science and Technology Park, Songshan Lake, Dongguan City, Guangdong province, is a high and new-tech enterprise and is engaged in researching & developing, producing, selling and after-sale services of the precision inspection equipments and electronic materials. It was founded in 1997 with a register fund 180million RMB.The company is since its foundation, with the concept of "honesty, hard work, innovation, caring" and the purpose to "meet customer’s satisfaction ", it has built and improved its business-oriented, market-oriented and production-research combined technological innovation system. At the same time, it has successfully established many R & D platforms such as Guangdong Ministry of Education production-research combined demonstration base, Guangdong precision instrument R center and Guangdong Enterprise technology centers, etc. Zhengye recruits many scientific and technological elites to research the four high-tech fields, that is, electronic information integration, optical mechanical and electronic integration, software and new materials. It develops and produces X-ray machines, UV laser cutting machine, automatic reinforcement machine, UV laser drilling machine, PP cutting machine, Hole Checker, TDR impedance tester , Ionic Contamination Tester, Thermal resistance tester and other precision equipments. All this machines have independent intellectual property rights and are widely used in PCB, lithium battery. And its consumables such as film series, Filtration Purification Precision positioning Precision photosensitive Dedicated Plastics and other electronic materials, are widely used in PCB, SMT, lithium battery, environmental protection and food industries.After years of steady development, the company has become a leading company in China printed circuit industry dedicated instruments line. In recent years, the company has undertaken 3 national and 10 provincial science and technology projects. One of its products has been named as the national key new product, 15 products have been named as provincial high-tech products and 5 products have been named as provincial independent innovation products. And below are the honors that Zhengye acquired:Outstanding national brand enterprise in the China electronic circuit industry for the first continuous three terms; Key high and new-tech enterprise of National Torch Plan; national standardization good behavior enterprise AAA unit; Preponderant enterprise in intellectual property; the major provincial-supported equipment manufacturing enterprises, etc.At present, The company has customers, including, ATL, AT , APCB, APEX, AKM, CMK, Elec & Eltek, FOXCONN, GUH, HUAWEI, KCE, MEIKO, MFS, OPC, TTM, VIASYSTEMS, etc.Its market covers the Pearl River delta and Yangtze River delta region and has exported many products to Russia, USA, England, Japan, Korea, Brazil, Singapore, Thailand, Malaysia, Vietnam, etc.In future, Zhengye Technology will continue to provide sincere service for customers and further focus on outstanding technical innovation. We will constantly improve the accuracy and stability of testing instruments, strengthen our brand construction with the aim to become a professional supplier of precision inspection equipments and electronic materials. Factory Info: Guangdong Zhengye Technology Co., Ltd.
Guangdong Zhengye Technology Co., Ltd.,(Stock code:300410) is a manufacture located in Dongguan City, Guangdong Province, which is a high and new-tech enterprise and is engaged in researching & developing, producing, selling and after-sale services of industrial laser cutting sytems ,laser marking, laser engraving,laser drilling machines,PCB making equipment,PCB testing machines and PCB consumables. It was founded in 1997, with a register fund $26 million. "honesty, hard work, innovation, caring" and "meet customer’s satisfaction " is company concept. 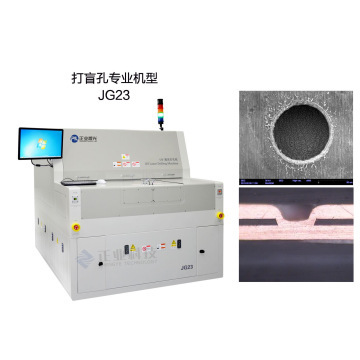 Provide laser cutting machine, laser drilling machine, prepregs cutting machine, X-ray machines, Hole Checker, TDR impedance tester , Ionic Contamination Tester, equipment. All this machines have independent intellectual property rights and are widely used in PCB, lithium battery. And its consumables such as film series, Filtration Purification Precision positioning Precision photosensitive Dedicated Plastics and other electronic materials, are widely used in PCB, SMT, lithium battery, environmental protection and food industries.After years of steady development, the company has become a leading company in China printed circuit industry.At present, The company has customers, including, ATL, AT&S, APCB, APEX, AKM, CMK, Elec & Eltek, FOXCONN, GUH, HUAWEI, KCE, MEIKO, MFS, OPC, TTM, VIASYSTEMS, etc.Its market covers the Pearl River delta and Yangtze River delta region and has exported many products to Russia, USA, England, Japan, Korea, Brazil, Singapore, Thailand, Malaysia, Vietnam, etc.In future, Zhengye Technology will continue to provide sincere service for customers and further focus on outstanding technical innovation.